“I am convinced that if we are to get on the right side of the world revolution, we as a nation must undergo a radical revolution of values. We must rapidly begin the shift from a thing-oriented society to a person-oriented society. When machines and computers, profit motives and property rights, are considered more important than people, the giant triplets of racism, extreme materialism, and militarism are incapable of being conquered. “A true revolution of values will soon cause us to question the fairness and justice of many of our past and present policies. … True compassion is more than flinging a coin to a beggar. It comes to see that an edifice which produces beggars needs restructuring. “A true revolution of values will soon look uneasily on the glaring contrast of poverty and wealth. With righteous indignation, it will look across the seas and see individual capitalists of the West investing huge sums of money in Asia, Africa, and South America, only to take the profits out with no concern for the social betterment of the countries, and say, ‘This is not just.’ It will look at our alliance with the landed gentry of South America and say, ‘This is not just.’ The Western arrogance of feeling that it has everything to teach others and nothing to learn from them is not just. “A genuine revolution of values means in the final analysis that our loyalties must become ecumenical rather than sectional. Every nation must now develop an overriding loyalty to mankind as a whole in order to preserve the best in their individual societies.” See here for text and audio. 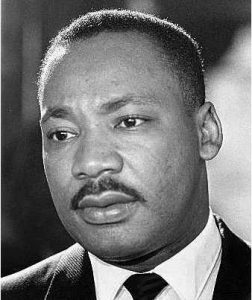 After King was attacked for his remarks at Riverside, including by media such as the New York Times and Time magazine, he spoke out even more passionately. From the pulpit of his own Ebenezer Baptist Church in Atlanta later that month, on April 30, 1967, he would deliver the sermon “Why I Am Opposed to the War in Vietnam,” in which he rebuked the major media outlets: “There is something strangely inconsistent about a nation and a press that would praise you when you say, ‘Be nonviolent toward [segregationist Selma, Ala. sheriff] Jim Clark!’ but will curse and damn you when you say, ‘Be nonviolent toward little brown Vietnamese children!’ There is something wrong with that press!” See here for video and text. This speech would later win a Grammy. Hagler is senior pastor at the Plymouth Congregational United Church of Christ in Washington, D.C. and chairperson of Faith Strategies. Ball is professor of communication studies, Institute for Urban Research at Morgan State University and author of I MiX What I Like: A MiXtape Manifesto and A Lie of Reinvention: Correcting Manning Marable’s Malcolm X.